It was going to fireworks between the SSDC and an opportunistic developer, Mead Realisations, over a controversial housing development at Templecombe, but the appeal before the planning inspector at Churchlands, Wincanton on Friday 27 September, turned out to be a very low key and incredibly polite debate between opposing barristers. At stake are plans for a housing estate at Slades Hill, Templecombe, a mile down the road from Horsington. It is difficult to find out what is going on, as the Council’s website does not appear to be up to date with the documentation. Even worse, there is no mention of the appeal hearing date and venue anywhere on the SSDC website, which may explain why only the Blog, the Mayor of Wincanton and a lady from Templecombe were there to witness the proceedings. A poor show. No doubt deputy heads will roll. 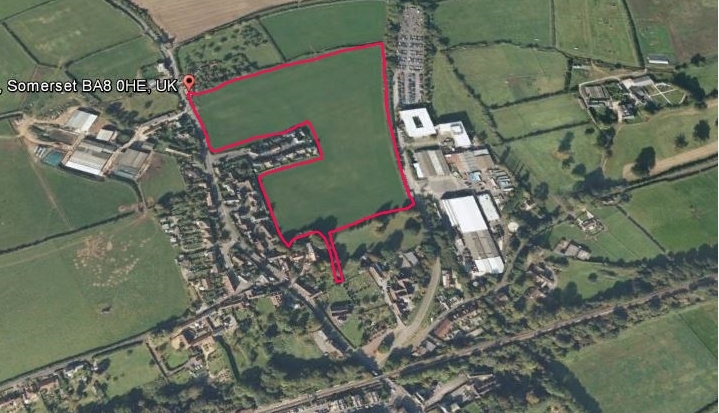 A year ago Mead asked for outline permission for 100 houses on a 16 acre site. The proposal included a retail unit, employment space, public open space, allotments and an area for school expansion. The SSDC failed to deliver a decision, and so Mead launched an appeal. The council believes the appeal should be dismissed on the basis of the development’s adverse impact on highways safety and on the grounds of unsustainable development out of scale with the character of Templecombe and its status within the hierarchy of settlements in the District. What this means is that Templecombe, despite its railway station and Thales, is small fry, and there are better, more appropriate places to develop. The Developer claims the council has acted unreasonably in refusing permission and that the reasons for refusal are unjustified. However, just in case the Council is right, they have amended their development to just 75 homes and taken out the retail provision. The Parish Council seem to have gone along with this. At the same time, the Council and the developer have agreed terms for what is called a “Section 106 Agreement”. This is the list of things the developer will do for the community if he gets permission – affordable housing, play areas, financial contribution to education, sports pitch etc etc. So while counsel on huge fees argue the intricacies of the finer points of planning law, the audience is left wondering what the real argument is about and what deals are being done behind closed doors. What is clear is that (a) the SSDC has lost a point or two (and maybe even the argument) by not having robust planning policies and procedures in place and that (b)planning law is now so complex that lowly citizens like ourselves will have to put up with whatever the bureaucrats and planners want to foist upon us. So much for the much trumpeted concept of localism. The Inspector’s decision is not expected for another few weeks, and at the hearing there was no sense from this master of impartiality which way he will go. We will tell you more as soon as the decision is announced. Next Next post: You really must get out more!